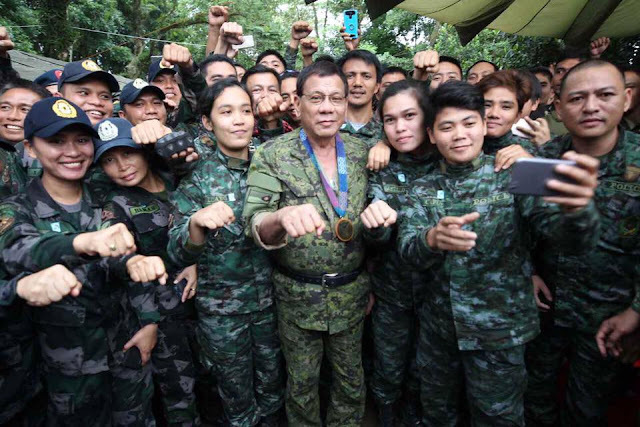 MANILA – Malacañang remains confident that President Rodrigo Duterte still enjoys overwhelming support from the military despite the latter’s claim that some soldiers are conniving with the opposition to oust him. Presidential Spokesperson Harry Roque made this reaction when asked during Thursday’s Palace briefing if loyalty check is needed to verify the President’s claim. “Sa akin po, lahat dapat tingnan. Pero sa tingin ko overwhelming po pa rin ang suporta ng Presidente galing po sa hukbong sandatahan (For me, everything should be checked, but I think the President still has overwhelming support from the armed forces),” Roque said. He said Duterte is the only President who has been making the rounds of almost every military and police camp across the country to personally know their needs and situation. Roque said the President is confident that the military and police will continue to do their duties as protector of the Filipino people. Recently, Duterte expressed his “ill feeling” towards some people in the military who are communicating with the opposition Liberal Party to remove him from Malacañang. “So dapat siguro i-verify itong mga impormasyon na ito. Pero kampante naman po ang Presidente na tumutupad sa kanilang tungkulin ang ating kasundaluhan at kapulisan (Perhaps this information should be verified but the President is confident that the military and police are doing their duties),” Roque said. Duterte earlier said the opposition is conspiring with the Communist Party of the Philippines - New People's Army (CPP-NPA) to dethrone him. Roque welcomed the investigation conducted by the National Bureau of Investigation (NBI) on the so-called “Red October” plotters. “Katungkulan naman po talaga ng NBI iyan at ng mga law enforcement agents na kapag may posibleng krimen na nangyayari ay dapat imbestigahan (It is really the duty of the NBI and the law enforcement agents to investigate possible crimes),” he said. He urged the military to share to the NBI any intelligence information about the “Red October” plot.